In the evening, meet your Tour Director and board the coach for a leisurely drive to Dover. On clearing customs & immigration, you take the ferry/shuttle to Calais. Upon arrival you proceed for an overnight and comfortable drive to Switzerland. Early afternoon you visit the gigantic Rhine Falls, Europe's largest plain waterfalls. You have some free time to admire the thunderous beauty of the falls. Early evening check into hotel & rest of the day is at leisure. This morning embark on an exciting excursion to Mount Titlis, which at 10,000 feet is the highest peak in central Switzerland. Your journey to Mt. Titlis is through a series of three different cable car rides, you will be amazed as the scenery changes from green meadows to scenic lakes to snow clad mountains. The last leg of the ascent will be in the world's first rotating cable car called the'Titlis Rotair'. Later proceed for an orientation tour of Lucerne, one of the six most frequently visited cities in the World. See the Lion Monument, which was designed as a memorial for the mercenary soldiers. You may take a stroll across the Kappelbrucke - the world’s oldest covered wooden bridge. 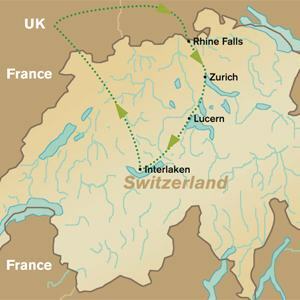 Today you leave the Swiss Alps behind and proceed towards France, you will join the super fast highways, driving past vineyards and mustard fields and head back to Calais for the short ferry crossing to Dover (stopping at services for lunch). Upon arrival at Dover, you proceed towards your final destination. Your tour ends here and bid farewell to all friends you have made on the tour. Euro prices are fixed but the GBP may vary if there are significant changes in the exchange rate.